All the city schools will begin a new chapter in decentralised waste management during the next academic year by installing biogas units on the campuses. The Kochi Corporation and Suchitwa Mission have joined hands in imparting the practical lessons in waste processing in city schools. Earlier, the local body had obtained the clearance from the State authorities for installing the plants in government schools within the city limits. It had also pushed the case of aided and unaided schools in the city as the second phase of the programme. The other day, the State government issued administrative sanction for installing biogas plants in 54 schools in the city limits including government, aided and un-aided institutions, said T.K. Ashraf, Chairman of the Health Standing Committee of the Kochi Corporation. The projects will be implemented with the financial support of the Suchitwa Mission. The agenda of the Corporation Council permitting an agency to set up the units in government schools was passed during the last meeting. Though only one agency had responded to the bid for setting up the units, it was sanctioned at the meeting as the Mayor declared all the agenda passed. The Mayor resorted to passing all the agenda in one stroke as a section of the Congress councillors and LDF members staged a walk out. The construction of the plants will begin in March when schools will close for the summer vacation. The units would be ready before June, when the educational institutions will reopen. 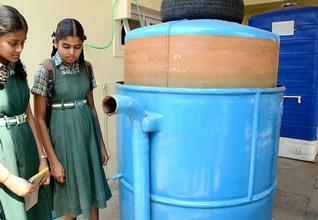 Students will be trained in managing bio-degradable waste at their educational institutions. It would be mostly food waste that would be going into the units. The capacity of the biogas units that are to be provided to the institutions will be proportional to the student strength, he said. The local body had earlier launched Bhoomika, an awareness programmes on waste management for school students. The students were encouraged to collect plastic refuse from their homes and store them at their schools, which would be picked up by the local body. The students were also provided incentives for the collection. The local body had also decided to provide nine biogas units and 1,500 pipe compost units to residents of every division as part of the decentralised waste management system. The beneficiaries of these projects were selected by ward meetings. These units will be provided subsidies too, Mr. Ashraf said.